− 4 = four Required Please enter the correct value. The silver price this week has been particularly disappointing, trading at its 2014 low for the last six trading days. 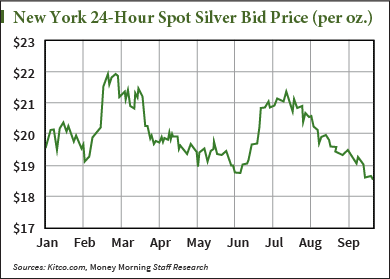 As of yesterday's (Thursday) close, the bid price for spot silver was $18.52 an ounce, down $0.09 on the week. Silver is also down 4.8% on the month, and for the first time is trading 5% down on the year. Similarly, silver futures for December delivery are down $0.09 on the week to $18.52 as of yesterday's close. They have also fallen nearly a dollar on the year, or 5.1%, and about 5% on the month. Other silver investments were hit as well. Exchange-traded funds backed by physical silver bullion closed at 52-week lows. The iShares Silver Trust (NYSE Arca: SLV), the largest silver ETF, closed yesterday at $17.77, down $0.12 on the week and down 5.3% on the month. The ETFS Physical Silver (NYSE Arca: SIVR) was down $0.16 on the week, and 5.2% in 2014. But the bad news for the silver price is tempered by bullish indicators that could spark a rally in the near-term and carry it up to the end of the year. At week's opening, silver was making slight gains, pushing forward about $0.08 before Wednesday's U.S. Federal Reserve Federal Open Market Committee (FOMC) meeting erased all those gains and then some. Silver lost 0.9% on the day, or $0.165. On average in 2014, silver prices drop a marginal $0.03 after FOMC meetings, though since the last two Fed meetings, silver has gained an average of $0.10. In this recent Fed meeting, nothing particularly surprising happened. The Fed tapered its two-year bond buying program another $10 billion, and signaled that next month it is likely to put an official end to the program. Fed observers have been looking carefully at any language that could reveal a more explicit timeline as to when the Fed will begin to offload its balance sheet and put upward pressure on interest rates. But Fed Chairwoman Janet Yellen has been offering the same vague guidance after every meeting, declaring that when the bond-buying does end, it will be a "considerable time" before interest rates spike. The markets have been watching closely for Yellen to drop the "considerable time" phrase, and there may be more clarity next month when the bond-buying program is expected to come to its official end. The silver price most likely moved on more hawkish indicators that came out of the meeting, suggesting that the Fed would in the near future back away from the inflation-friendly policies it has been pursuing since the financial crisis started. "There is a clear shift within the FOMC towards a less dovish stance with regard to the current state of the labor market, with regard to asset prices and with regard to the outlook for interest rates, evidenced by the comments of those voting against the decision; by those expecting a rate rise next year and; by the calculated median outright interest rate by the end of 2015," said Atul Lele, chief investment officer of Deltec International Group, according to Marketwatch. Two notable changes did signal more hawkish sentiment from the Fed.